Although the crying baby took so much attention, his sister, only 19-months his senior, was not exactly changing her own diapers either. I can remember her recognizing the opportunity for mischief when I was nursing the baby. She would wait until I was occupied with him, and then run get the wipes and pull them out one-by-one, putting them on her head, or wiping my mirrors, or something just out of reach, but not dangerous enough for me to stop what I was doing. Just more mess. The days would go by, and I would feel as though my punch-in clock had actually reversed. There was more on my “to do” list and nothing crossed off. All I did was clean up messes that weren’t even there when the day had begun. No progress. Had I even seen “the boys” that day? For the 5 years before boy #3 arrived, we had referred to our first two children as “the boys” and then we had the baby girl. “You bring ‘the boys’ and I will bring the baby,” was how we spoke. Now that there was another boy, it seemed odd if not impossible to break our habit, so we continued referring to the older ones as “the boys” and the next two as “the little ones,” which were the exact terms my had parents used for my brothers and me, coincidentally. I was convinced that in and among the crying baby and needy toddler, “the boys” were being neglected. In two years, their world had been turned upside down with lack of Mommy time, not to mention that we were building a new home simultaneously. I am sure that to many, this seems like a perfect job for Dad, but my husband prefers sleeping at sunrise (since he reads late into the night), and is not much for fishing any time of day, so it was the perfect opportunity for me to educate the boys, and spend quality time away from crying babies. Since we could not trust getting a cell phone signal, I would take one walkie talkie and leave the other one with Chris, next to the bed, so he could get in touch with me when the cryer awoke. The boys and I would head to the lake in the backyard, using a Polaris Ranger to navigate the hill. My goal was to get there, get the canoe out of the barn, trolling motor attached and be afloat before the sky was lit. This gave us about one hour, +/-. Even during the school year, we could be out on the lake and back by 7:45am, ready to attack the day. The boys had to be able to tie their own line and take a fish off the hook in order to participate in the privilege of early morning fishing. It was never hard to wake them when fish were waiting. What memories we have! From my walking on water when I realized there was a snake in the boat with us, to feeding the nest of spiders to the fish, to singing “Great is Thy Faithfulness” as the sun crested the trees, to the treble-hook in my cheek from my son’s casting error, to the 39inch pike, the big ones that got away, and the kids that didn’t; God blessed us with some wonderful mornings. I took photos last week and paused to take in the moment. 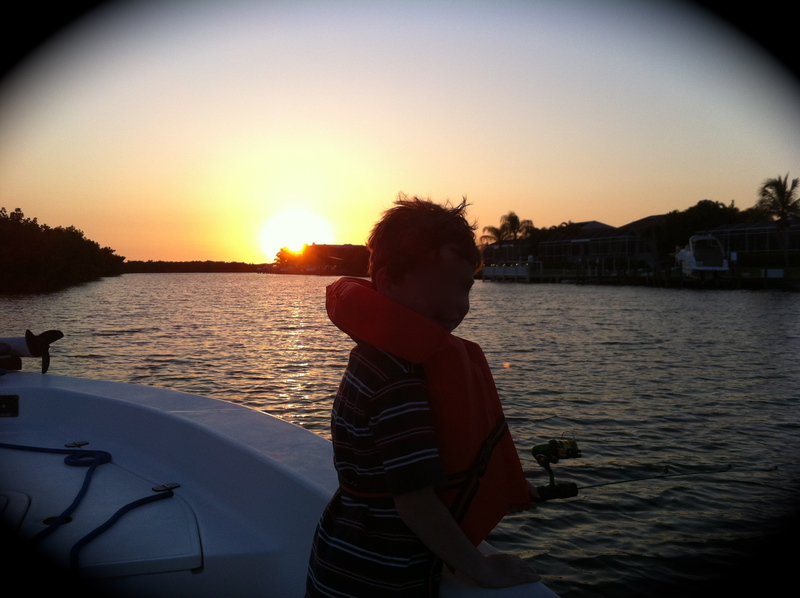 That tall, handsome, drawn-out body of my teenager’s silhouette in the gorgeous dawning light made my heart flash-back to the little boy who started the tradition, with the big orange life jacket hindering his every move. As the song says, “Sunrise, sunset. Swiftly fly the years.” I guess I can really thank God for my crying baby, because in my desperation, it led to a blessing of memories and traditions that outlasted the tears. 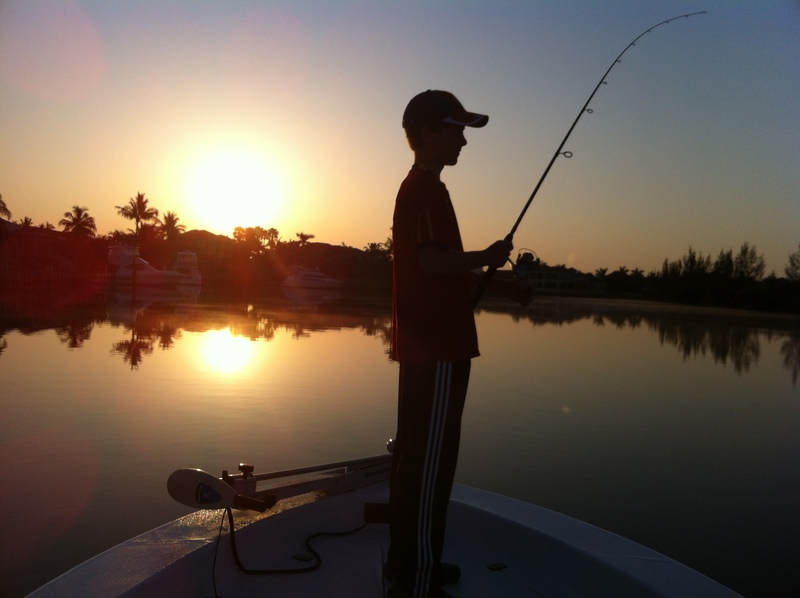 This entry was posted in Motherhood, Personal Growth, Rooted in Faith, Sister to Sister, Uncategorized and tagged boys, Chris Brady, Family, fishing, mother-son, motherhood, Parenting, recreation by Terri. Bookmark the permalink. This was the perfect thing to read this morning! Thank you so much for sharing, Terri! There are days when I need to be reminded of the blessings He’s given me in these strong-willed, curious, mischevious, sassy, ALL-BOY boys (3 1/2 and 19 months)! I truly hope you consider writing a parenting book for us to read and learn from! Have a fabulous day, Terri! Once again you are able to bring me back to reality. This morning as I lay in my bed with “the girls” my son and husband are out turkey hunting and enjoying there “early morning fishing”. My crier woke me at 4:30 am and the toddler hearing her sweet screams came toddling into my bed for morning snuggles and a little movie time. I’ll remind my self that this time is precious and try my best to stay awake. That was awesome Terry! It reminds of the time my dad took me fishing and making my first attempt at casting, I prematurely “pierced” my ear! I just read this to my nine year old who’s favorite past time is to go fishing at the river at the end of our road! I really need a property with a waterway in the back! I will! Thanks again and see you on Friday at the Major! Wow Terri! This one really hit me, being in the in this stage of life-Again! This is really a good one for reflection and implementation. Thank you so much for sharing your life stories for others to learn from. Keep shining His light ;). God Bless! ignore some of the chaos. I too feel as though my oldest gets neglected. I have prioritize my time to ensure she gets my time too. Bless you for being such a great role model for all TEAM moms! Amen Terri. Always cherish each age and “stage” with each one. A day will come when you will yearn for those times. Terry thank you so much for sharing this memory of your family. It really made me pause in my busy “work by day,mom by night” world. Keep sharing I love to read your thoughts! You never fail to fill my heart Terri. As a Counsellor in a small town that has seen all of our manufacturing companies close and either move to the States or to Mexico, I listen to people and their problems from sunrise to sunset. When I get so that I am feeling down, it is so nice to get an email from you, Chris, Orrin, Wayne, or George. I follow as many of our LIFE members that I can. I miss Jackie and I think about her almost every day. You and your blogs and books mean a great deal to me. I give a lot of your books to my people in need. God bless you and keep writing! I recently met a mother with a baby daughter of a year and a six year old daughter AND a husband looking for attention too ~just want to say I have new respect for mothers. I told her to enjoy them now because very soon they will be grown ups!